Many identify the ‘Tohoku Mathematical Journal’ with just one paper published in it, affectionately called the Tohoku paper: “Sur quelques points d’algèbre homologique” by Alexander Grothendieck. In this paper, Grothendieck reshaped homological algebra for Abelian categories, extending the setting of Cartan-Eilenberg (their book and the paper both appeared in 1957). While working on the Tohoku paper in Kansas, Grothendieck did not have access to the manuscript of the 1956 book of Cartan-Eilenberg, about which he heard from his correspondence with Serre. But, what does this have to do with the literary group OuLiPo (ouvroir de littérature potentielle, ‘workshop of potential literature’)? Oulipo was founded in 1960 by Raymond Queneau and François Le Lionnais. Other notable members have included novelists Georges Perec and Italo Calvino, poets Oskar Pastior, Jean Lescure and poet/mathematician Jacques Roubaud. Several members of Oulipo were either active mathematicians or at least had an interest in mathematics. 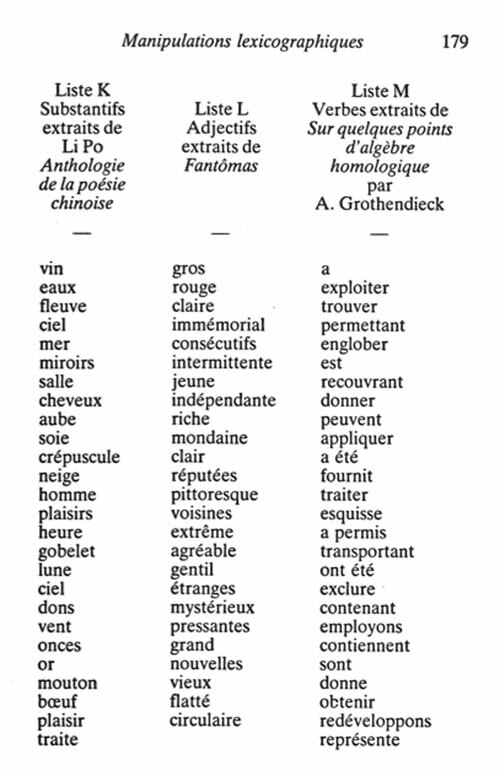 Sometimes, Oulipo is said to be the literary answer to Bourbaki. The group explored new ways to create literature, often with methods coming from mathematics or programming. One takes a source text A. One ’empties’ it, that is, one deletes all nouns, adjectives and verbs, but marks where they were in the text. In this way we have ‘prepared’ the text. Next we take three target texts and make lists of words from them, K the list of nouns of the first, L the list of adjectives of the second and M the list of verbs of the third. Finally, we fill the empty spaces in the source text by words from the target lists, in the order that they appeared in the target texts. In the example Le Lionnais gives, the liste M is the list of all verbs appearing in the Tohoku paper. Previous Post Where is Fogas? Founder WordPress Theme by Compete Themes.